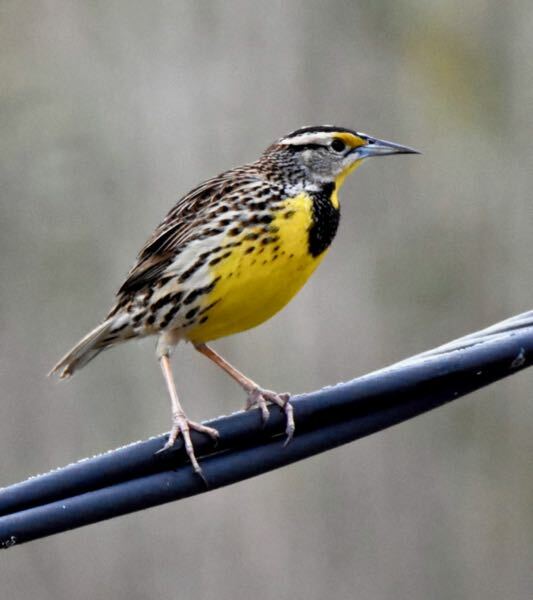 Eastern Meadowlark, photographed at Harold Campbell Public Use Area, Palm Beach County, in January 2018. The eastern meadowlark, Sturnella magna, can be easy to spot at times, difficult at others. It will perch on a fence post, a power line, or in the case of the photos on this page, a support cable, and sing for all the world to see and hear. But it also is a ground forager, perfectly plumed to disappear into a sea of grass. In places up north, its song is considered a harbinger of spring. It's a year-round resident of Florida, found throughout the state anywhere there is suitable habitat. That means grasslands, pastures, fields, marshes, open pine woods and prairies. 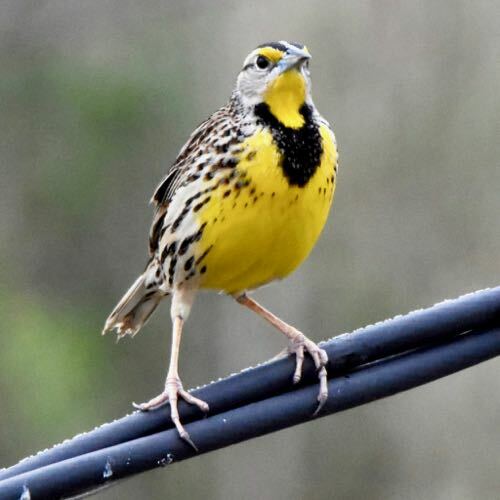 The eastern meadowlark tends to stay put throughout much of its territory, which includes the eastern and central United States, the Southwest, Mexico, Central America and South America to Brazil. Only in the northern extremes of its range — New England, Canada, the Great Lakes region — does it become migratory. It's an easy bird to identify, with its bright yellow, throat, chest and belly with a black "bib" across the front. The back is a subdued brown mixed with some whites and blacks. The head is a mix of dark and light stripes, the dark beginning at each eye and extending to the back. A third dark stripe extends back from the face. The bill is relatively long and thin. It is a medium-sized bird, with a body length between eight and 10 inches and a wingspan that can approach 16 inches. Both sexes have the same color mix, but females can be slightly smaller.There's one subspecies, found in Arizona's grasslands, called Lilian's that has more white in the tail and brighter white cheeks. It has one look-alike, the western meadowlark. The resemblance is so close that the most reliable way to tell the two apart is by their song reportoire. However, the western meadowlark, like its name suggests, has a more westerly range. The two birds do overlap, but the only place that happens in Florida is the extreme western end of the Panhandle. As we noted above, it is a ground forager. It will hop and run along the ground looking for grasshoppers and crickets and other bugs. Insects make up 75 percent of its diet, the remaining 25 percent is seeds. Nesting season in Florida is between March and July. Females do most of the reproductive heavy lifting from nest-building to feeding the offspring. The nest is a weave of grasses on the ground and well camouflaged. It might have a roof of sorts or a "porch." The typical clutch is two to six eggs, though some say three to five is a more accurate spread. The eggs take about two weeks to hatch; all the sitting is done by mom. Mom also handles most of the feeding chores as well. The young fledge in 10 to 12 days; they'll stick with their parents for two weeks afterwards. One reason for the lack of parenting by dad: he might be off with a second family. In Florida, mom might have a second brood as well. 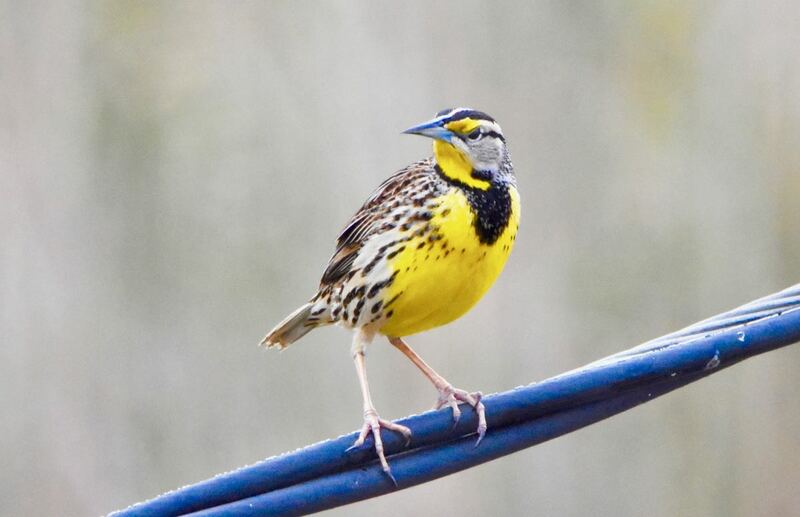 Despite the name, the eastern meadowlark isn't a true lark, but rather a black bird, a member of Icteridae.